When learning the laws of the road, one of the most important steps is becoming familiar with traffic lanes and how they are marked. Observing lane barriers is essentially the only thing that keeps traffic moving in an organized and safe manner. Freeways generally have at least two traffic lanes moving in either direction, but in large cities, you might see four or even five. The lane farthest right is for large or slow-moving vehicles. It is also the lane you will usually need to be in to make an exit, although in certain circumstances, you will need to exit from the left. The center lanes are for medium-paced traffic, and the left lane is either for fast-moving traffic, carpooling or passing. If the far-left lane is for carpooling, it will be marked with a special sign and logo. 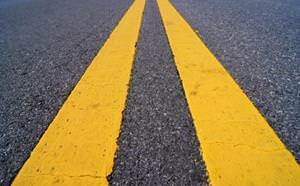 Traffic lane dividers are the painted lines that separate two lanes on a road. There are many different varieties, and it’s important to have an understanding of what each represents before you get out there and begin practicing driving. If you see a solid yellow line between your lane and the opposing lane, it means that it isn’t currently safe to pass. This type of line means that passing may be safe, but you should still proceed with extreme caution. Always check very carefully that the road ahead is clear before you attempt to pass a car. In this case, you may only attempt to pass if the broken line is on your side. If the line on your side is solid, it means passing in the direction you are headed is not safe. If you see two solid lines, it means passing is prohibited. It’s never a good idea to break the law, but in this case, making an illegal pass could potentially cost you your life. Much like a singular set of double yellow lines, two sets cannot be driven across. Generally, this marking indicates a barrier. Think of it as a wall and don’t cross it unless you see a designated entry area. If you see a solid white line, it means the nearby lanes are going in the same direction as you. Broken white lines separate traffic lanes on two-way roads that have more than one lane going each direction. You are able to merge between these lanes as long as it’s safe. These lines indicate the start of a lane that is designated for special use. A carpool lane is a good example. Like double yellow lines, they are illegal to drive across. Carpool lanes (also called HOV traffic lanes) will have areas of broken white lines where you can enter or exit. Carpool lanes have different requirements depending on the area you’re in, so be sure to pay attention to the signs. Most busy streets have center turn lanes that allow you to wait to turn left without holding up the traffic behind you. These traffic lanes are marked by an inner broken line and an outer solid line on each side. Keep in mind that these lanes are only for turning left and are not to be used to speed ahead or pass slow traffic. You may only drive for 200 feet in the center lane, and when you’re there, be sure to watch for vehicles that may be using the same traffic lane to turn left from the opposite direction.